The month of November is fast melting away and December is already knocking in. Kenyans are approaching that month where almost everything will skyrocket in terms of prices. Any avenue that gives one an opportunity to save any little cash this festive season is not something just to let it pass by. This morning, when I heard about Masoko and the offers they are ‘dishing’ out to their customers, I could not believe. 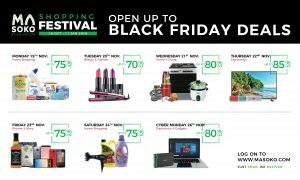 Can you believe that Safaricom’s e-commerce platform Masoko customers will enjoy discounts and deals of up to 85 percent during the Masoko Black Friday taking place this week? 85 percent? Meaning people are buying things at 15 percent of the original price? How will this work? Masoko Customers will get the opportunity to buy phones, electronics, foodstuff, beverages among other items. In the run-up to Black Friday, customers have this week been enjoying various deals ranging from home shopping, beauty and fashion, phones and accessories, electronics and gadgets among other products. In October this year, Safaricom launched a three months campaign dubbed ‘Masoko Shopping Festival’ which will run until January 11, 2019. During this period, customers will be getting discounts on a variety of electronic goods, mobile devices, fashion accessories, foodstuffs and beverages purchased on Masoko. Fellow shoppers, you need to save that coin. The longest ‘Njaanuary’ is coming and discounts will help you a lot.